Two new songs are on the way for all the Coldplay fans of the world. 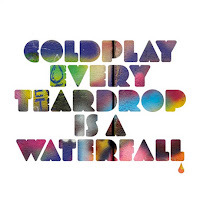 Earlier this month the band gave us the new song 'Every Teardrop Is A Waterfall' and now they are releasing the song along with 2 new ones as part of a 3-song EP. The new songs are titled 'Major Minus' and 'Moving To Mars'. The new EP is set for a digital release of Sunday, June 26th. I know Coldplay have become the "I hate this band" or "the I Love this band" over the past few years and it is easy to be critical of the 'Every Teardrop Is a Waterfall' song but it is still hard for me to leave behind this band who once put out an EP quite opposite of this called "The Blue Room EP" (which btw I personally own a copy that I bought at HMV for $5 back in the day). I am still a Coldplay fan at heart and am very interested in hearing the two new song additions. With the release of this EP it makes you wonder if and when an actual full length album will come about. Seemed like it was rumored there for awhile that they would have a new album sometime this fall....we shall see if that comes to pass now. 'Major Minus' is scheduled to be posted today at 4 PM (1 hour away) and 'Moving To Mars' is set for posting early tomorrow evening. The actual physical CD and 7 inch out Monday, June 27th and can be preordered here.